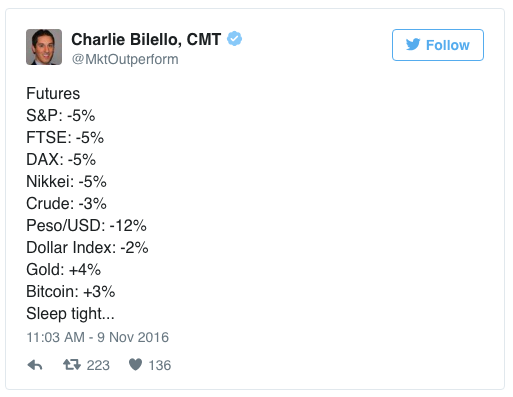 Cryptocurrency markets are stimulating after Donald Trump has been elected to rule the country. It has been happening since the election night when Trump’s victory started becoming more evident. Bitcoin prices steadily increased at that time. The prices reached to a height of $738, rising from a price of $703. It was the end timings of US polls that the prices started rising. But now, the current rate of Bitcoin has dropped to $725. The dropped price of the Bitcoin is nowhere as bad as the stock market. After Trump’s victory, US citizens are not sure about the future prospects of the country. They are under pressure and are buying gold and Bitcoin as future investment. This is actually making the prices go up. People are focusing mainly on these two forms of currency as these are the only form of investments considered to retain value when regular currencies will be of no use. They fear the doomsday that has yet to come. For them, Trump’s selection may not be the end of time but it is surely a beginning to change behaviors of the traders in the country.